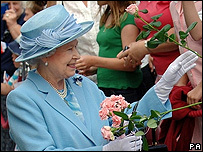 A Hampshire market town has been left with a bill for nearly £60,000 - including £5,000 for a new loo - after a visit from the Queen. Her Majesty and the Duke of Edinburgh were in Romsey in June to mark 400 years of its Royal charter. The town council was expecting to pay about £20,000 but new rules meant Romsey tax payers had to pay security costs, pushing the bill up to £58,500. A new toilet was also installed in the town hall, but the Queen never used it. Romsey's town clerk is now warning other authorities to consider the costs before issuing invitations to the royals. Judith Giles said: "I think all event organisers now should learn a lesson from what we've been through at Romsey and understand that there are significant costs involved." However, Romsey's mayor said the cost only started to escalate in the month before the visit and the council was left with no choice but to fund the royal requests. Mark Cooper said: "If we didn't spend that money, we were told - in no uncertain terms - that we would lose the royal visit." Some of the costs were incurred because the responsibility for security arrangements no longer lies with police, and risk assessment and evacuation plans ended up costing an extra £17,000. Thousands of pounds also had to be spent on safety barriers, carpets and curtains. The Queen and duke spent three hours in the town on 8 June to celebrate Romsey being awarded borough status by King James I in 1607. The town council has already received a contribution from the county council to help with its royal bill and said it was also seeking assistance from the district council. In spite of the hefty bill, the people of Romsey now have a new public toilet to use since the "royal loo" is now open to the public.